Political parties are also large organisations and require management, as much as corporates do. The Obama team is a classic example and would have all elements that make a corporate organisation, from management positions, IT teams, distribution networks, and what not. So we saw lakhs of people on the streets paying homage to the departed Balasaheb, and several more glued to the television screen. Undoubtedly, the man had a massive support base, and the numbers tell the story. And yet, there are questions asked about the future of the party after him?! The same party whose leader’s death generated such a massive response from the people, may have questions about its future, post his demise! This is a classic case where an organisation needs to find the right balance between a charismatic and popular leader, while also building a strong base of the organisation itself. Organisations do need good leaders. And these leaders also typically have a larger than life presence. Bill Gates, Richard Branson, Steve Jobs, etc. are all leaders of that kind. Yet, Gates managed to pass the baton smoothly enough. Questions were raised about Apple post-Jobs, but the company had enough inherent strength and a strong leadership team, that belied any doubts that may have existed in people’s minds, about the company. In all these cases though, the outside world, while having seen a good leader, had also experienced the strong brand underneath. Political parties have a slight difference. The leadership HAS to be even stronger than a corporate leader. It is on the strength of the leader, his oratory skills etc. that the party wins or loses elections. There is a very strong association of the leader to the brand of the party. Which is the case with the Sena at this time. Sena = Balasaheb and Balasaheb = Sena has been the association, with the result that there are a lot of question marks amongst ordinary people, and perhaps the party cadre also, about the future of the party. Which leads us to the point of succession planning. Large organisations with huge stakes always worry about succession beyond the current leader. The boards of such companies realise the enormous stakes and usually have a plan in place, for succession. If the leader is young enough, the plan may be a concept, but as the leader advances in age, and approaches a retirement level, then the plans get more specific. The well planned identification of a successor to Ratan Tata, and then the year long transition with Ratan Tata being beside Mistry, is an excellent example of good succession planning. Which sadly did not happen so well at the Sena. Well, Uddhav has been leading the party for a while now, but for any kind of impact, be it at the Dusshera event or during elections, it was still Balasaheb who had to lead from the front. In a sense, as was his classic statement when the Sena was in power in Maharashtra, he still held the “remote control”. I am sure Ratan Tata will hold no such remote control at the end of the year. Perhaps he has already put it aside! And that is where the difference lies. Now this could have happened because Uddhav did not show strong leadership abilities? And had to depend on Balasheb’s presence to make any impact to the masses and to the cadre. If that was the case, and if ultimately the organisation was bigger than the individual, there should have been boldness to bring in a better leader! But transition to the new leadership was a must! 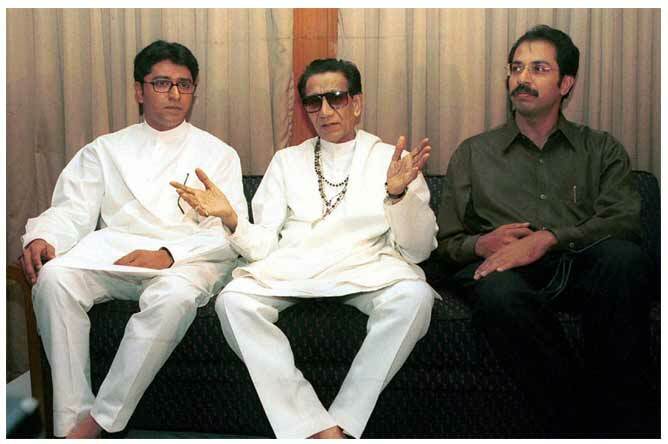 Not that Balasaheb passed away suddenly. There was time enough to plan this well. But then again, unlike pure professional companies, when it is a family owned / run company, it is not always the best interests of the company that impact decisions, rather, it is the best interests of the family. And sometimes these best interests may not be so right for the organisation concerned. Such challenges have been seen in companies, and it is certainly no surprise that the same are seen here in a political party. Then again, there are family run enterprises in India who think bigger and bolder today, and do bring in professional management, and realise that the organisation is a bigger asset and they must do what they can, to ensure its continuity and continuing growth. Those families who make this transition for their companies, have managed to sustain long term growth. Others have seen the decline, usually by the time the second or third generation of the family takes control of the companies (there will be the rare exceptions to this). If the Sena could have also thought about going beyond the immediate family, the future might have looked more secure. 3. Insecure to give us the throne too early? Today’s political parties in a sense, resemble the erstwhile kingdoms in India. And there have been many moments in history, when the prince has usurped the throne from his father, the king, or even put the king behind bars, or even had him killed. Just to get the throne. Sibling rivalries were even more common. Political parties are not too different. Would a leader worry that if he hands over the reins too early, he will be relegated to a life without importance, without power, without clout?? Does that make even an old leader to keep his hold on his seat of power, and not make way for the successor? We have seen such incidents even in the corporate world. Apollo Tyres is an example that comes to mind. It is a rare individual who having enjoyed tremendous clout and power, is able to move away, into a life of relative calm and away from it all. Perhaps the need is to find another purpose, a different passion. Bill Gates comes to mind. His passion for his current goals ensures that he doesn’t miss the seat of power which was the Microsoft Chair. When we work with brands, and sometimes see the extreme finickiness that some brand managers display about their brands, we may wonder why so. But over time one realises that brands are built over long years, and once a brand it built, that perception sticks. Usually for long, long time! If a particular telecom company gets slotted as a cheap and poor service company, it is extremely hard to get that impression out, no matter what it does. Yes, brand reputations stick for long. Which is why we are seeing the strong anti-Thackeray and anti-Sena emotional outpour. The smallest incident of unrest in the city, at this time, and people are ready to condemn the Sena. Whether the incident was doctored by the Sena leadership or some local goons, it does not matter. NRIs from far and wide recollect the violent incidents that they had experienced when they were in India, many years back, and that is the perception they carry about the Sena. So it does not matter now, if the Sena leadership had instructed their cadre to stay calm and peaceful, and largely the peace was managed. Their past, their reputation, hounds them. And can’t be shirked off. So there will still be many fingers pointing at the Sena, even if it was proven than non-Sena people had done some damage, that will not be believed, and the Sena will get the blame. Yes, a brand’s reputation becomes its legacy. Can’t get it off easily. The same is true for corporate brands. Which is why I appreciate more now, the obsession that some brands display, on getting all communication just right, from their brand’s point of view. It is important that the right brand perception is created and maintained too. Reactions to my Facebook DP (Display Picture): What’s Changed? !